Used to be a good venue for bar billiards, sadly no table there now. Having spent considerable time reading the reviews we decided to visit this pub for Sunday lunch, as the reviews were quite favourable. The beers are very good but there is not much choice of lager. Four of us ordered different meals for Sunday lunch. None of us were impressed at all and all were disappointed. The Roast Beef dinner was dreadful. Two chunks of beef (quite tough) accompanied by two burnt 1/4 of medium roast potatoes very overdone and soggy, with three cut 'rings' of carrot and (I kid you not) a 1/4 of a small cabbage leaf. That was the sum total of the veg. Swamped in gravy with a yorkshire pud. Somone needs to learn how to cook roast potatoes and what is considered a normal portion of vegetables to accompany a roast dinner. It doesn't have to be too much but it should be a reasonable amount, not a toddlers portion. The vegetarian bean chilli could have been so much better - tiny portion (did state this on the menu) at the very bottom of a deep dark bowl (bad presentation). The bowl emphasised its appearance, which was of something unpleasant. However, it did taste good. The plain white rice was on its own, next to the deep bowl, and consisted of very overcooked chunky rice (risotto or pudding rice strangely). It was accompanied by a minute pot of salsa and guacalmole squashed in together (almost looked pre-bought like that but might not have been) It did not look appetising. However, there was a nice amount of sour cream in another pot. To improve this meal I suggest using a different lighter coloursed (inside at least) and smaller dish to present the bean chilli, use a basmati rice (or similar) and improve the salsa/guacamole. The service was okay. Not bad and not excellent. We might return for drinks in the future but the meals we will remember for all the wrong reasons. We did however, pop around the corner to another pub (Forresters) for a drink, to get over our lunch disappointment, only to witness other people being served roast dinners that appealed to the eye with a decent (almost too much) amount of roast pototoes and vegetables. It looked lovely but not sure what it tasted like, obviously. We will try their sunday roast out next time instead. As we live in Hall and Woodhouse territory (Blandford, Dorset) and were visiting Horsham on Good Friday, we decided to dine at the Hornbrook Inn, and were nor disappointed. The food was of a very high standard and the prices for food and drinks were very reasonable. 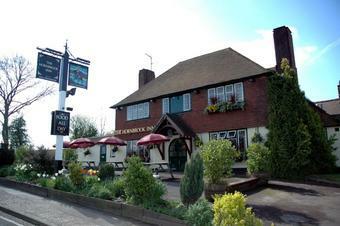 The staff including the landlady were all very pleasant and we will not hesitate to return next time we are in Horsham. Our recent visit to this pub for a Sunday meal was fantastic even in view of problems. As a Hall & Woodhouse pub it has a good selection of pump bitters, and they all tasted great. The manageress was encouraging bitter choosers to try the guest Lemony Cricket ale with a small sample. This was a welcoming touch. Our meal was good pub fayre, but it took a long time coming. The manageress apologised profusely when she brought the food, despite no complaint from us. An extra bowl of chips and free coffees was a further apology. All in all a very positive experience. Good beer, good food and a well-presented pub. We'll be back.